In the Technodrome, Krang surveys the damage to his Foot Soldiers and the injuries sustained by Bebop and Rocksteady all thanks to the Turtles. Displeased, Krang insists he can do better than Shredder and comes up with a plan to destroy the Turtles once and for all. 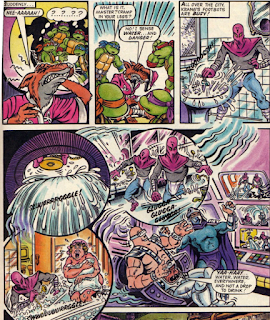 Later, the Turtles are sitting down for pizza when Splinter gets a psychic premonition of dangerous water. As it happens, the Foot Soldiers are invading every bathroom on the surface and running all the taps and flushing all the "loos" at once, causing the sewers to flood. The Turtles and Splinter are swept away in the tide before they can even grab their weapons. A Foot Soldier in a mini-sub keeps tabs on their progress through the sewers and reports to Krang where the Turtles and Splinter will be surfacing. Krang and Shredder then plot an ambush at that location. And that's exactly what happens. The unarmed Turtles surface and are surrounded by Foot Soldiers. The Foot drive them into a blind alley and Bebop and Rocksteady bear down on them with their guns. The Turtles escape into an adjacent building and find themselves in the abandoned Carver City Film Studio. Getting an idea, they run and hide in the costume department. 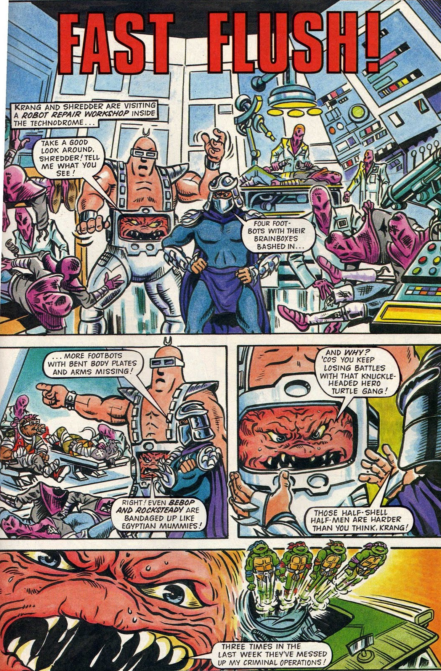 Krang leads his army into the studio and past the costumed dummies, only for the "dummies" to spring to life and attack. 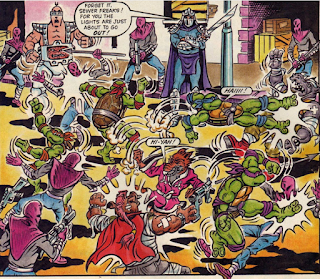 With the element of surprise on their side, the Turtles take down the Foot Soldiers. They then use a large fan to blow Krang, Shredder, Bebop and Rocksteady out of the studio and into a fountain. With the day saved, the Turtles figure they can use the fan to dry out their lair. *This story was originally published with "Help! Where's the Pizza?" 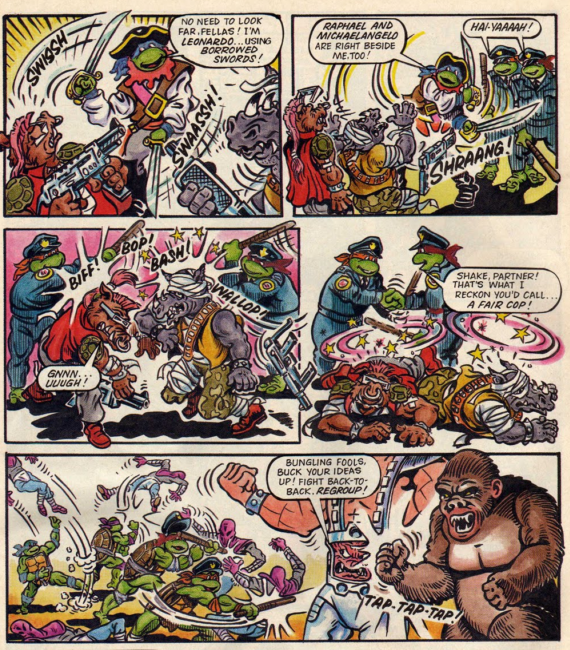 Wow, I guess the theme of this Hero Turtles issue was "unfeasible evil schemes". The previous story had the Foot destroy all the pizzerias in New York and that seemed pretty unlikely. Not to be outdone, this story has the Foot turn on all the faucets and flush all the toilets in the city. With manpower resources like that, I don't know how these guys keep on losing. The story is ridiculous, but that's half the charm of these Fred Wolf era Turtle stories. They're supposed to be bonkers. Problem with this one is that it abruptly segues from one idea into something completely unrelated, as if two scripts got fused together at the middle. The story suddenly switches from the Turtles getting caught in a flood to "fun at the costume department!" That film studio comes out of nowhere just to give this comic an ending. 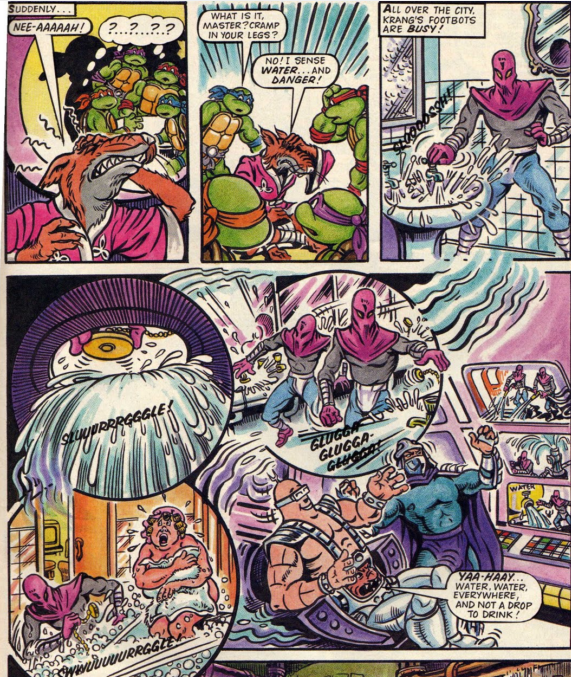 Also, man, the lair gets trashed a lot in these Hero Turtles comics, doesn't it? Both stories in this issue feature it getting ransacked or demolished, but it also got blown to Kingdom Come back in TMHT Adventures #15. Good thing this is one of those comics that always ends with a press of the Reset button. I mean, I'll give them credit for not straight-up tracing someone else's art, but they're still a copycat. Whoever they are. That's another one of these UK things down. I think I'm going easier on them since I haven't reviewed one in a while. They're stupid, but if you take them in modest portions once every few months, the stupidity is more fun than it is irritating. But I still gotta do like 40 more of these things. Jesus. 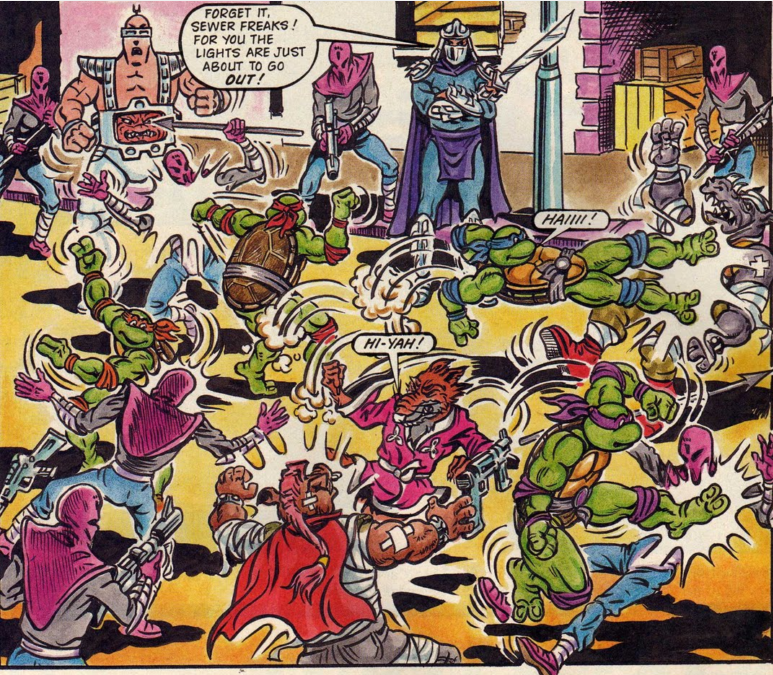 Honestly, coordinating a full-city flush is probably one of the best plans Shredder and Krang ever came up with. It's too bad their brilliance was undone by the convenient location of a prop studio. 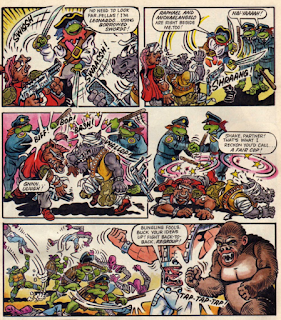 But, it does give the Fleetway comics yet another opportunity to draw gorilla costumes. I think the Foot Soldiers in lab coats is hilarious.